The father of three boys placed in isolation after possibly being exposed to measles is urging Albertans to get properly vaccinated. 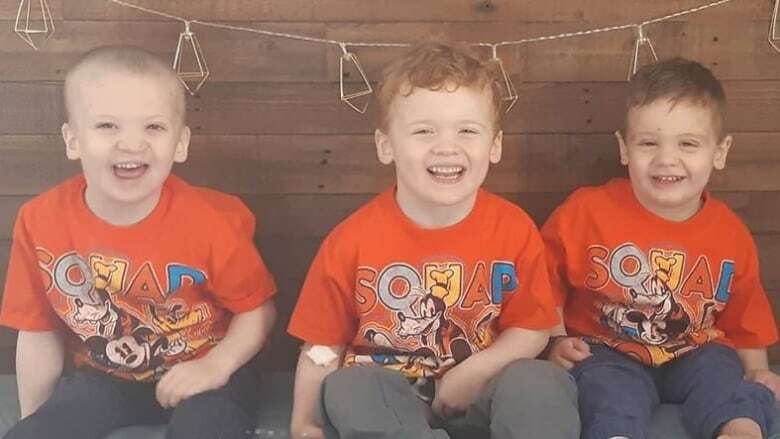 Dennis Rempel's sons were born with purine nucleoside phosphorylase deficiency, a rare genetic disorder affecting the immune system which leaves the body vulnerable to illness and infection. For Wyatt, 5, Grayson, 3 and Elliot, 2, a measles infection could be life-threatening. "Kids get sick all the time but when you hear about measles and all that entails; a possible exposure that was the worst, the most stressful," Rempel said in an interview Monday with CBC Radio's Edmonton AM. The family passed through the Edmonton International Airport on Feb. 13 on their way home from a trip to Disney World in Orlando funded by the Make-A-Wish Foundation. Soon after they returned to the family home in Millet, they came across a public health alert from Alberta Health Services. A person infected with measles had been at the airport on the same day — and there was a risk of exposure to the extremely contagious, airborne virus. "It was quite scary for us," Rempel said. "Measles is bad enough, but with our boys it could be much much worse and the chances of them contracting it would have been much higher than a normal individual." The boys have never been inoculated against measles as their immune systems are too weak to handle vaccines. "Chances are they would contract measles right off the bat." he said. "They have zero immune system." The boys spent a day at the hospital and were given an infusion of antibodies. They spent the next two weeks at home in quarantine. "We kept them at home and the whole entire time we were watching for any signs measles, any signs of rash or fever and had we experienced any of those symptoms we mostly would have ended up back in the Stollery. "It was definitely a tense time." The exposure risk was a big setback for the boys, Rempel said. They have spent most of their young lives in isolation, unable to attend school or even step foot inside a shopping mall for fear of infection. After nearly two years living in isolation, they were given the all-clear by doctors to attend pre-school for the first time this year. Rempel hopes his family's ordeal will serve as a reminder to everyone that vaccines save lives and protect the most vulnerable. "In Canada, we are blessed enough with the economy and the technology to have this life-saving vaccination," he said. "There are countries around the world that are desperate to have this and if we have the option for it, we need to get it, not just for ourselves but for the protection of those around us. "If we have the tools and we're blessed with the tools, not taking it is just downright irresponsible." In the meantime, Rempel's boys are in good health and high spirits. The two older boys returned to school on Wednesday. "When my wife dropped them off on the first day, they were basically singing and dancing when they got to see their friends and their teachers. "They're very excited and happy to be out."